You’ve spent the day exploring and are now in need of some serious sustenance. 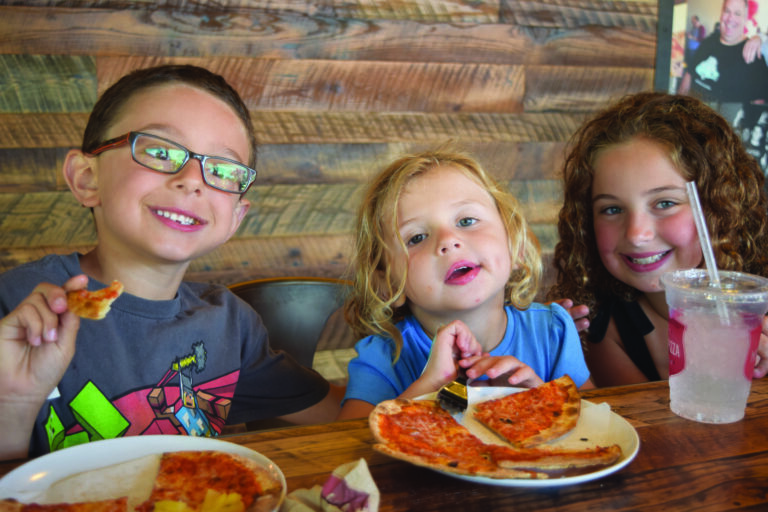 Pay a visit to one of these family-friendly restaurants—or breweries!—for tasty food and an atmosphere your kids will enjoy. Seattle Center adventurers love the affordable dining options at the Armory (*305 Harrison St; seattlecenter.com). You can’t go wrong with choose-your-own-toppings pies at MOD Pizza (modpizza.com) and treats at Seattle Fudge (seattlefudge.com). Further north, the Ballard neighborhood is home to several kid-friendly craft breweries. Little buccaneers love the seafaring decor at Maritime Pacific’s Jolly Roger Taproom (1111 NW Ballard Way; maritimebrewery.com). X marks the spot with a full menu of kids’ meals such as sliders. Or have a pint with your half-pint at Populuxe Brewery (826B NW 49th St; populuxebrewing.com), where families relax on the covered patio for a bean bag toss or fire pit chat. Local food trucks stop here every Friday and Saturday night for an always-changing dining lineup. Eat in true Seattle fashion at Chinook’s at Salmon Bay (*1900 W Nickerson St; anthonys.com). Kids get a kick out of watching the North Pacific fishing fleet amid bites of prawns and chips. Keep the seafood theme going at Blue C Sushi (*1510 Seventh Ave; bluecsushi.com) in downtown Seattle. The conveyor belt entertains little ones, who can easily grab dishes that tempt their taste buds. Other family hot spots include the cafe at Beecher’s Handmade Cheese (*1600 Pike Pl; beechershandmadecheese.com) in Pike Place Market, where kids can munch on the self-proclaimed “world’s best” mac and cheese. Magnolia’s Serendipity Cafe (3222 W McGraw St; serendipitycafeandlounge.com) is another welcome respite, with toy-stocked kids’ areas and a scrumptious menu of familiar favorites to boot. Want to splurge? Soak up a bird’s-eye view atop the Space Needle at SkyCity (*400 Broad St; spaceneedle.com), where standard kids fare gets a face-lift in a souvenir Space Needle meal box. Even better: Every visit to SkyCity includes free observation deck admission, so the kiddos can take in the incredible Seattle panorama with full bellies.